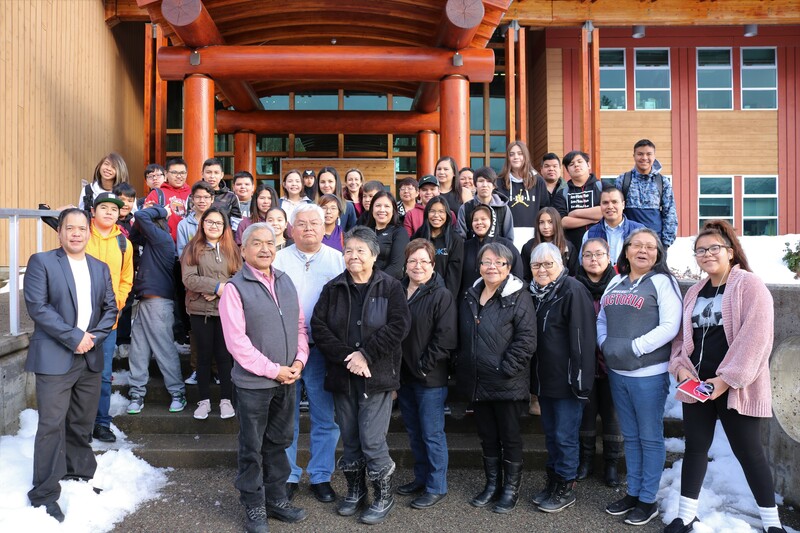 On January 16, 2019, Nisga’a Elementary Secondary School (NESS) students made a visit to Nisga’a Lisims Government (NLG) to tour the Legislative Chambers and to hear about Nisga’a history. Upon the tour, they were greeted by the Enrollment & Eligibility Committee elders, the Communications Department. The students were presented with words of encouragement, history of Nisga’a Land, and how the Nisga’a Tribal Council (NTC) and the Nisga’a communities, laid out the foundations of health, education, and governance for the benefit of future leaders. It was the NTC and SD#92(Nisga'a) that initiated school field trips to the many Annual Fall Assemblies where they were granted opportunity to partake in the framework of the Nisga’a Treaty as well. Furthermore, it was the NTC that brought career workshops to NESS which resulted in the many professions seen today. Most importantly, the NTC performed many sacred ceremonies alongside students of NESS to carry on the Nisga’a language, culture, and traditions in absolutely everything they do to unify community as a whole. It certainly was an honor to have the NESS students make their first 2019 visit to the NLG Chambers, many more to come. The respect shown and their adherence to the chambers was like a strong sense of belonging, identity, and authority. Si’aamhl wilsim on your brave introductions. Dakota Price was honoured Sunday evening at the ISPARC Premiere's Awards for Indigenous Youth Excellence in Sport. Dakota was one of nine Northwest Regional Recipients to receive the prestigious award and also one of the youngest. "14 year old Dakota Price is a basketball and volleyball athlete from the Nisga'a and Haida Nations. Dakota's first time playing in a high level volleyball club, they took first place at the BC Club Volleyball Provincials, first place at school volleyball taking home the zones banner. Second place at the school basketball zones, she also participated in the Invite-Only Jr. NBA Next Combine Series. She also participated in the BC Summer Games/Team Northwest, it was the first time in the history of the BC Summer Games that the Northwest team entered. 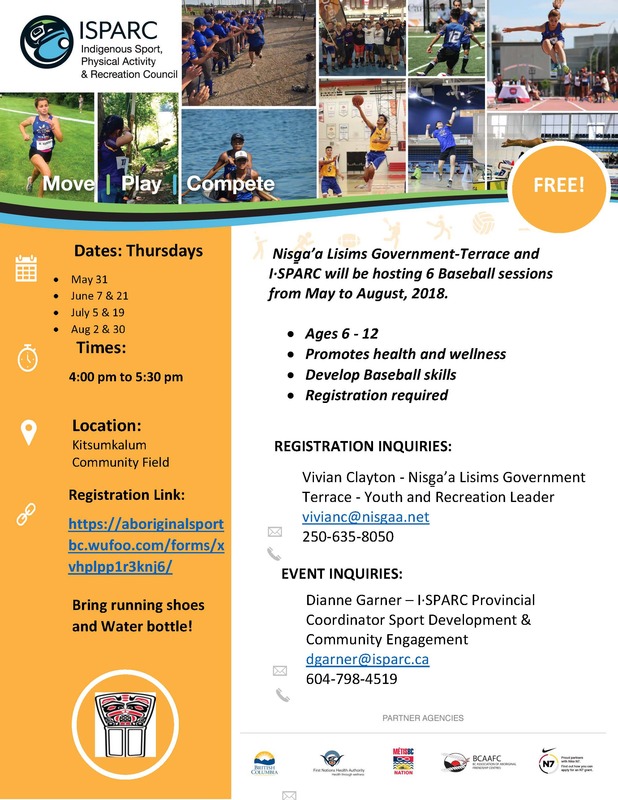 She has received Nisga'a Tribal Tournament all-star, Female Athlete Award at school and has volunteered to help younger kids play basketball at youth camps. She is passionate and dedicated to her sports. Dakota is an honour roll student, she participates in traditional dancing, native women's fitness groups, serving tables at feasts, helping her grandmothers in the smokehouse, cedar weaving and canoe journey's. Her goals include, continuing to play sports, training to stay in shape, and would like to eventually get a scholarship in basketball." - Introduction to her award from ISPARC. Congratulations Dakota! Back to school it is and time to hit the books! This year’s Back to School March is taking place in the four Nisga’a Villages to commemorate our history, show support to our students, and to inspire a successful school year. Students from Kindergarten to grade 12 begin the school year by sharing a meal with their community, schools staff, respected chiefs and matriarchs. After the meal, they gather strength in numbers, march as one to schools lead by the Lisims RCMP and the chiefs as they perform a cultural song to the march. Once arrived to the school, the staff are assembled strength in numbers with drums as they perform the song; Ts’inin Sim’oogit to show honor to the chiefs, matriarchs, and students as they enter. Students and staff are then seated to witness Nisga’a Cultural Protocol take place by the Council of Elders. The ceremony is conducted by four chiefs, representing four tribes of the four villages, along with the Chairperson of the Council of Elders, Willard Martin, and Madam President, Eva Clayton of Nisga’a Lisims Government. This traditional ceremony was passed down from generation to generation by the Nisga’a Nation Elders and first began with the Nisga’a Tribal Council during the beginning of the Nisga’a Land Question. It’s called the presentation of the Ganim Siwilyeenskw. This ceremony grants an organization in the fields of health, education, and or governance the authority, blessing, and responsibility to move the Nation forward, this time being a ceremony for the Principals, they are handed the talking stick and granted authority to move the students forward with their educational journey. The ceremony is followed by introductions to new staff, an introduction to this year’s student board representation from the four communities, words of encouragement, and an overview of goals and objectives for the year. The Principal, Mr. Cameron Nott made two important announcements, first; “With technology today, we are seeing tremendous changes, that’s what we have to do, all of us at NESS will be looking at those changes so that we can get those programs in so students really want to be here. 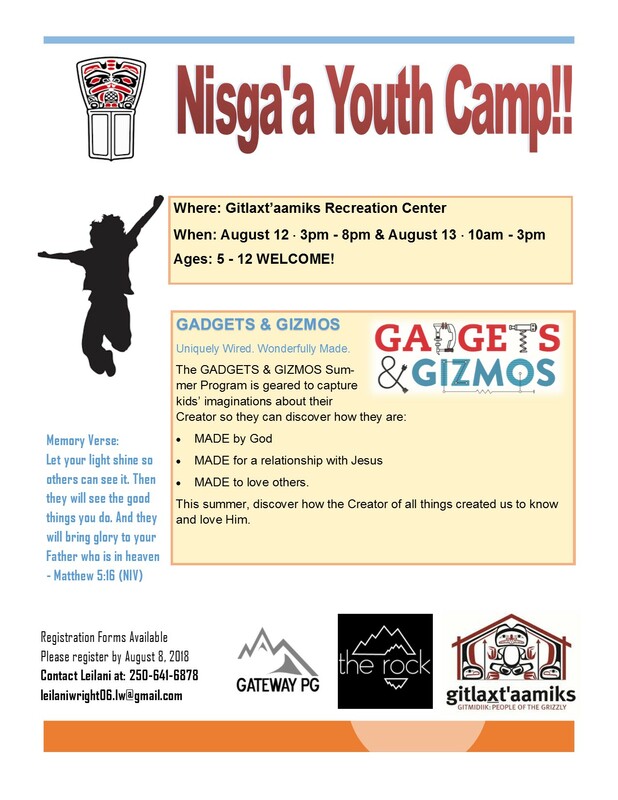 Secondly; “There’s opportunities for Nisga’a Elders to come in and to share knowledge, wisdom, to keep the Nisga’a culture and language strong, and vibrant. By keeping culture, language, and traditions strong, we are joining as one. Nisga’a Lisims Government will continue to show our support to staff and students of School District #92 Nisga’a in the Nass Valley, we encourage all students to do their absolute best and we look forward much more UNITY to come. Nine seats were filled in the public gallery of NLG’s legislative chamber by Nisg̱a’a youth observing the monthly meeting of the NLG Executive on January 24th. The young Nisg̱a’a are currently participating in the Nisg̱a’a Employment Skills & Training (NEST) Bladerunners Program. A program funded by ACCESS to provide youth entry level training in the construction and mining industries. "We involve cultural training as the baseline of all our programming", says NEST Pathways Coordinator Melissa McKay. Prior to obtaining certification in the field of study, the students complete one week of cultural training to learn more about Nisg̱a’a culture and the Nisg̱a’a Treaty. As part of their cultural training the cohort of youth received an overview of the Nisg̱a’a Treaty from former President Mitchell Stevens. They then spent a half day observing the NLG Executive to learn more about government processes. President Eva Clayton and members of the NLG Executive extended a warm welcome to the youth. "The reality is, you will be sitting here one day, so I am very encouraged to see that you are taking an interest in Nisg̱a’a Government", said President Clayton. This is the third group of youth to complete the Bladerunners program. Two other cohorts completed the training with a focus on hospitality and customer service in October and November 2017.